Security is a huge concern for most modern companies. Because of this, employers need to make sure all employees have the appropriate identification. MyBinding Badge Reels are made of top quality materials. Designed to allow you to clip your ID badge to your body and extend it out to use in access systems or to show security guards, you can clip our badge reels to a belt, key ring, or necklace for display. This ensures that the ID picture can always be seen. Choose from a wide variety of colors, styles and reels built for specialty applications. These badge reels are bright, user friendly, sturdy, colorful, and help to keep your workplace safe. 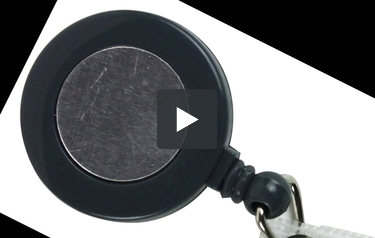 Welcome to MyBinding video with the guaranteed lowest prices and best selection of badge reels on the web. These high-quality round badge reels are designed with a contoured bullet that locks in place when the reel is retracted. This helps to ensure that your badge or ID won’t twist as you wear it. These reels are available in both solid and translucent colors and have your choice of swivel or belt clip. All reels come with a badge attachment and most extend to 34 inches in length. As part of our outstanding customer service, we do plenty of custom orders, and we can make a badge reel the way that you need it for you next event. When image matters, MyBinding.